ST. ROSALIA was daughter of a noble family descended from Charlemagne. 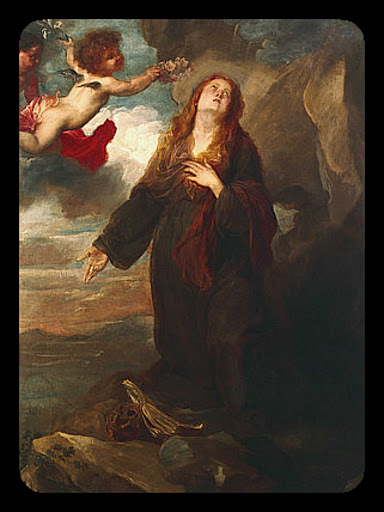 She was born at Palermo in Sicily, and despising in her youth worldly vanities, made herself an abode in a cave on Mount Pelegrino, three miles from Palermo, where she completed the sacrifice of her heart to God by austere penance and manual labor, sanctified by assiduous prayer and the constant union of her soul with God. She died in 1160. Her body was found buried in a grot under the mountain, in the year of the jubilee, 1625, under Pope Urban VIII., and was translated into the metropolitan church of Palermo, of which she was chosen a patroness. To her patronage that island ascribes the ceasing of a grievous pestilence at the same time.